Sunroof, Navigation, Leather Seats, Cooled Seats, Heated Seats! 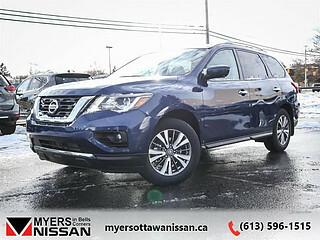 This Nissan Pathfinder is a smart choice for a three-row crossover that's big on style and versatility. 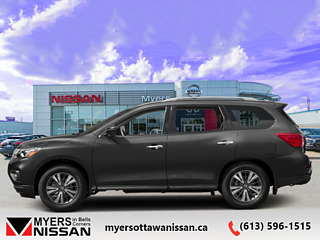 Load up the entire family with space to spare in this Nissan Pathfinder. This versatile crossover is just as at home eating up miles on the highway as it is running errands around town. 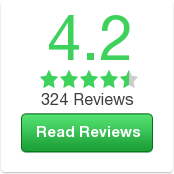 With a comfortable interior and respectable fuel economy, the destinations are endless. 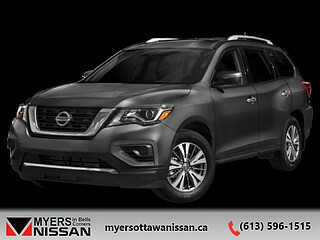 A sculpted exterior makes this Nissan Pathfinder is one of the most stylish three-row crossovers on the road. Capability at this level always makes for memorable adventures. This gun met SUV has an automatic transmission and is powered by a 284HP 3.5L V6 Cylinder Engine. Our Pathfinder's trim level is 4x4 Platinum. Upgrade to this Pathfinder Platinum and experience luxury with capability. It comes with a dual panel panroamic moonroof, navigation, Bluetooth, SiriusXM, Bose 13-speaker premium audio, tri-zone entertainment system with a DVD player, HDMI input, and wireless headphones, leather seats which are heated and cooled in front, Bluetooth, an around view monitor, remote start, forward emergency braking, and more. 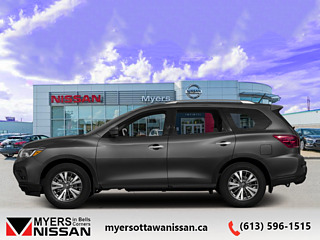 This vehicle has been upgraded with the following features: Sunroof, Navigation, Leather Seats, Cooled Seats, Heated Seats, Dvd Player, Premium Sound Package. Total rebate of $6000 is reflected in the price. Credit includes $6000 non-stackable dollars and does not qualify for lower subvented financing rates. See dealer for details. Buy this vehicle now for the lowest bi-weekly payment of $293.48 with $0 down for 84 months @ 4.99% APR O.A.C. ( Plus applicable taxes - and licensing fees ). Incentives expire 2019-04-30. See dealer for details.